Swiss firm Herzog & de Meuron has taken cues from "monastic architecture" to design a research campus high above Los Angeles. After a lengthy process, the studio was selected for the project by the Berggruen Institute – founded in 2010 with the aim to "study and apply new ideas to the workings of social, economic, and political institutions". "Herzog & de Meuron were appointed as the architects for the new facility after an intense phase of conversations with various architects around the world, visits to their buildings, and meetings with their clients," said the architects in a statement. 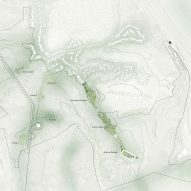 For the new campus, the institute has acquired at 450-acre (182-hectare) parcel of land in the Santa Monica Mountains, close to the Topanga Canyon State Park northeast of the city. The site will accommodate a broad programme that combines areas for living, eating, study and meetings – much like a monastic community. "Since ancient times, monasteries have been places for individual study and reflection as well as group exchange and gathering," said Herzog & de Meuron. "In line with such scholastic tradition, the program incorporates the natural surroundings." "The Southern California climate makes it possible to provide spaces for exchange both indoors and outdoors, accommodating small, concentrated study groups as well as large symposia." Across the steep terrain, the main buildable areas are along two ridges that reach up to 1,700 feet in altitude, either side of a deep canyon. "The Berggruen Institute is a landscape vision as much as it is an architectural project," said Herzog & de Meuron. "Crucially, to minimise the impact, the project will be built, where feasible, only on land that has already been modified." A portion of the vast site – at the southern tip of the eastern ridge – used to be a landfill, but was capped and flattened in the 1980s. This spot is reserved for the main research building, which will take the form of a rectangular concrete-framed structure lifted above the ground. 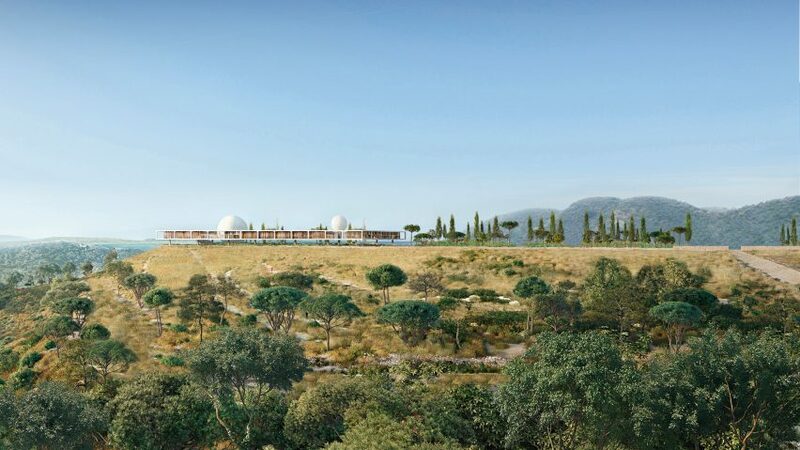 Two domes will rise from its central courtyard, the larger housing a lecture theatre and the smaller containing a water reservoir. "The spheres both physically and symbolically represent the socio-cultural and ecological ambitions of the Institute," the studio said. Inside the building will be wood-lined areas for individual and group study, and for presentation and workshops, as well as living quarters for those attending. The research building will form the culmination of a linear park stretching along the ridge. 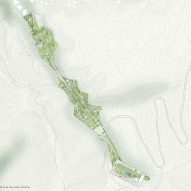 Moving north through the landscape of native plants, kept green by an innovative water-management system, a path will pass through a Scholar's Village for visiting academics and fellows with families. They will be housed in single-storey courtyard homes, which will appear as continuations of the landscaped features. At the end, a Chairman's Residence will feature earth-coloured walls and a roof with a deep cantilever to shade outdoor spaces for entertaining. Planned for the western ridge is a series of cottages, pavilions and art installations. Herzog & de Meuron – ranked fourth on the first Dezeen Hot List – is well-known for its ambitious projects. These range from the Elbphilharmonie concert hall in Hamburg to the Tate Modern gallery in London, but neither match the sprawling footprint of the proposed Berggruen Institute.